Free Number Guess Game Application. This rather simple game begins something like "I'm thinking of an integer between zero and ninety-nine inclusive, and to your guesses I'll respond 'Higher', 'Lower', or 'Yes!' as might be the case." The game in this application we played with the numbers. For example, if the number were 11, the following sequence of guesses could be used to find it: 1 (Higher), 2 (Higher), 4 (Higher), 8 (Higher), 16 (Lower), 12 (Lower), 10 (Higher). Now we know that the number must be 11 because it is higher than 10 and lower than 12. In the beginning it gives you 10 trials. And whenever you try a number, the trial numbers decrease. 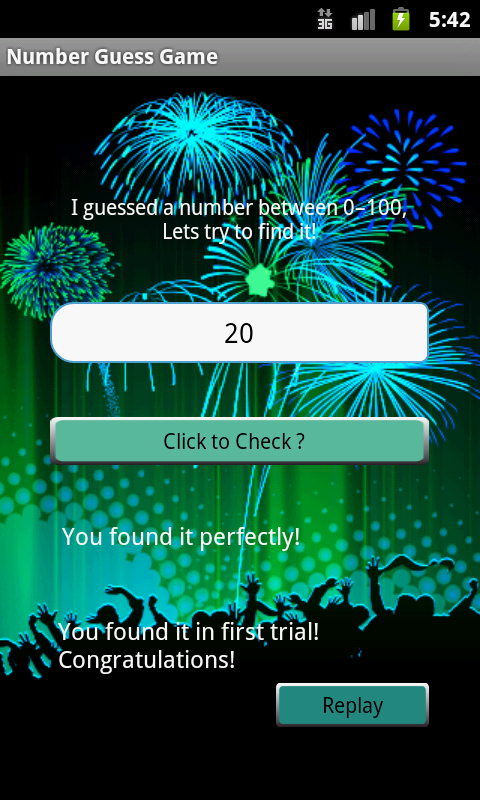 When you find the guessed number, the application also shows that in which trial you find it. If you could not find in 10 trials, it shows game over screen.In the game over screen, it also shows the number picked. If somehow(I mean by chance) you find it in first trail, the background image change to the fireworks one. Let's find what the number guessed by your smart phone! To see our other applications,please click here. By olivercan, Keep Calm because All is Well!